A call to CSO Yachts confirms that Claude Niek’s central listing, the 28.25m Mangusta motor yacht Taiji, has had another price reduction. Built by Italy’s Overmarine yard in 2006 to a Stefano Righini design, she's Bureau Veritas classed and accommodates eight guests in a master, VIP and two twin cabins. 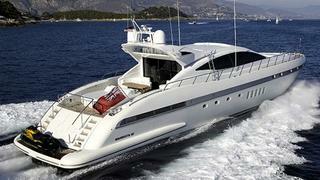 Twin 2,400hp MTU engines give her a cruising speed of 35 knots. She has never chartered, and has been only lightly used by her owner since new. Taiji's asking price is now down from €3.3 million to €2.65 million.